“It’s time to take to the streets”, said Saoradh, as it announced a protest action at Ardmore PSNI barracks in Newry next month. There here had been a “notable upsurge in state force harassment” directed at Saoradh members, supporters and other republicans both in the Newry area and further afield, said Stephen Murney. “Since Saoradh was launched a year ago our party members have come under constant attack by the PSNI and MI5,” he said. “Daily stop and searches, house raids and arrests are just the tip of the iceberg. “Over the past few months Saoradh have become increasingly active in the Newry area as we pursue our revolutionary project to rebuild the republican struggle. “We have recruited new members and we are currently in the process of building a solid support base. We are organising on a number of levels and we are working on several issues of concern within our communities. This has clearly unnerved our enemies and has been met with overt and covert attention from the British Crown Forces and their MI5 proxies. This is the same for our activists across the country”. Murney continued: “Our protest will be loud, radical, robust and will directly challenge these human rights abusers right on their doorstep. We won’t sit back any longer. It’s time to take to the streets and make it clear that we won’t be intimidated by these gun-toting thugs nor will we let them go unchallenged. We are in the business of reorganising and rebuilding republican resistance to the British occupation and no amount of PSNI/MI5 harassment will deter us from that path. “We urge all those who oppose human rights abuses to join with us in facing down this militia. This protest action is just the beginning”. 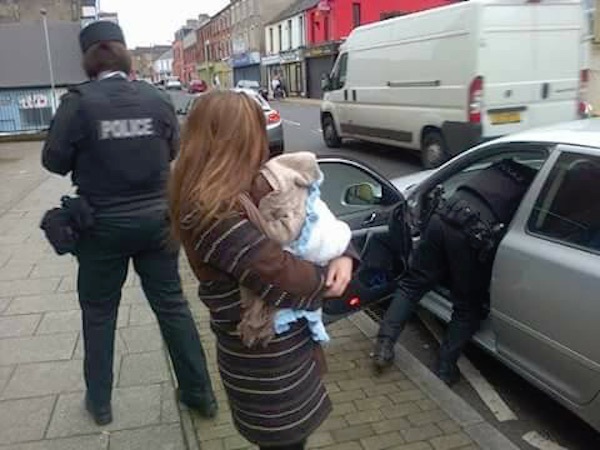 Republican activists in Derry and Belfast have reported scores of incidents of stop-and-search harassment and arrests over minor infractions, many of which have been directed at families with young children and documented on video. They pointed to a recent freedom of information request by Ardoyne residents which showed that within that small area there had been over 3500 stop and searches, over 240 raids, over 140 arrests and almost 30 charges brought under draconian “terrorist” legislation over a five year period. “This includes the harassment of a number of Cliftonville players’ and coaches’ families - not to mention supporters. Not one conviction resulted from any of these instances of harassment, and this pattern is replicated across the Six Counties,” they said. They also pointed to the targetting and recruitment of vulnerable people as informers, “including children”, and “the blind eye” turned to drug dealers. “The PSNI are MI5-directed, unaccountable, unreformed and irreformable. They remain a force for Britain, not a service for the people and never can be while the illegal occupation of Ireland continues,” they said.